Negative pressure makes a smooth interior. Bottom drape can be customized and can be made in vinyl for rain resistance. Sturdy aluminum frame allows outdoor use in good weather. Features a two meter spring line for open events, so height is 5m for 6m diameter dome and 6m for 8m dome. Packs in 3 rolling packing cases for shipping or storage. As an example, our 6 meter Geo-go-Dome Geodesic Negative Pressure Dome can be erected by 3 people with power hand tools and a step ladder in under 3 hours. The structure is perfect for indoors where you want to avoid the issues associated with deflating a positive pressure dome and at the same time have an open inviting space for people to come and go as they please without the feeling of being trapped inside a closed structure. 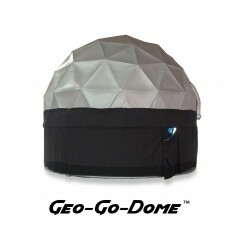 At the moment Go-Dome is offering 3 sizes of Geodesic Negative pressure Domes. Our 5 meter Geo-Go-Dome, designed for indoor use only and perfect for trade shows and indoor events. Go-Dome's 6 and 8 meter Geo-Go-Domes are designed for either indoor use or temporary outdoor use under restricted conditions. Note on outdoor use: We have designed the 6 and 8 meter Geo-Go-Domes for "Non-Certified Temporary Use" - so they will withstand 20 mph winds and 45 mph gusts. Under this classification, the structure can not remain erected outdoors for longer than 20 days in a row.